Despite the plethora of health warnings about sun damage and UV rays, we still somehow manage to walk away from a lounge chair looking red like a lobster. Wanting to get a nice tan can often result in subjecting the skin to an excessive amount of the sun’s damaging UV rays. Fortunately, there is no need to suffer any longer. There are many effective sunburn treatments that can help you get through the burning sensation and soothe that painfully irritating sunburned skin. Applying cold compresses on the damaged skin. Taking a cool bath to soothe the burning. Using sunburn creams that contain ingredients such as menthol, aloe and camphor. Taking nonsteroidal anti-inflammatory drugs such as naproxen and ibuprofen to relieve the swelling and burning sensations. Aside from this, there are many home remedies and lifestyle changes that can help to alleviate and eliminate sunburn altogether, such as avoiding the sun while sunburn is present and staying hydrated. Stick to shady areas during the times when the sun’s rays are strongest, between 11 am and 4 pm. If you don’t want to avoid the sun completely, you can always sunbathe when the sun is not as dangerous. You can still even get a nice tan! Always use sunscreen when exposed to sun rays. You should cover all areas of skin that could possibly be exposed to the sun with broad-spectrum sunscreen, which should protect you from both UVA and UVB rays if used properly. At least one ounce of sunscreen should be used. Be sure to pick a sunscreen with a sun protection factor (SPF) of at least 30 and apply it 30 minutes prior to being exposed to the sun. Sunscreen should be applied even when it is cloudy or overcast, as UV rays are known to penetrate the clouds (see more below). You must be extremely careful when exposed to sun rays. It is very easy to underestimate the power of the sun, especially because the redness associated with sunburn does not develop until much later. Sometimes you may feel burning on your skin while still exposed, but in many cases people get sunburned without even noticing. When you are purchasing sunscreen, you must make sure that it is of high quality and protects you from harmful rays. 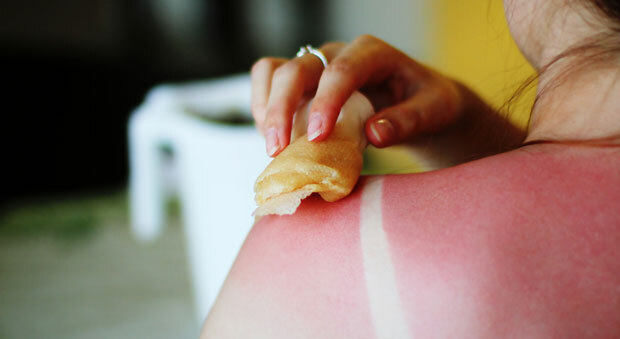 Use of poor-quality sunscreen can limit your defense from sunburn. A circle logo with the letters UVA and UVB on it. At least 4 star protection of UVA and UVB. Second, make sure you are applying sunscreen properly. The majority of people suffer from sunburns because they do not apply enough sunscreen. The body needs approximately one ounce of lotion. If the sunscreen is applied too thin, it will provide less protection. If you are concerned about not applying enough, you can always switch to another sunscreen that is stronger than the one you already use. If you are planning on spending a significant amount of time in the sun, you should apply sunscreen twice before exposure, once approximately 30 minutes prior to going out and a second time just before stepping out. Sunscreen should be applied to all skin areas that are exposed, including the face, the ears, and the neck. However, when it comes to the head, the best solution is a wide-brimmed hat. Third, sunscreen should be re-applied several times, especially if exposed to water or sweat. If you are sweating or are in contact with water, make sure that you always use water-resistant sunscreen. This type needs to be reapplied frequently, liberally and according to the given instructions. This includes applying sunscreen right after getting out of the water or after towel-drying or sweating. Every person who is exposed to the sun and UV rays is at risk of sunburn. However, some people are more vulnerable and prone to getting sunburned than others. The sun is more intense at high altitudes. Keep in mind that you can also get sunburn from the sun’s reflection off of water, concrete, snow, and sand. Always take the right precautions, even when you are not planning on being directly exposed to the sun’s UV rays. The time and severity of skin burns varies from person to person. You can always check online for the skin type you have and check if you are at high risk of sunburn. Covered with suitable clothing that does not allow sun to penetrate. Kept in the shade when possible. Protected with strong sunscreen that is applied more frequently than it is in adults. Given additional doses of Vitamin D, even if they are not directly exposed of the sun. Normally, sunburn is not long-lived and is mild, but it is very important to avoid it. The skin normally starts to peel and flake after a couple of days, and it should heal completely after 7 days, if not too severe. Even if it may not seem serious at the moment, sunburn can increase the risk of developing other serious health problems later in life. The important thing to remember is that sunburn is not solely what you see on the outside. Even if you heal the skin on the outside, the inside can be more damaged and too much sun exposure can often lead to serious conditions, such as skin cancer. If you or someone close to you suffers from sunburn, you should get out of the sun and move indoors or into a shady spot as quickly as possible. Mild sunburn can be easily treated by some effective home remedies, but severe sunburn should be treated by a medical professional. Sponge the skin with cold water, take a cold shower or bath, and apply a cold compress to the affected area. Drink a lot of water or fluid to prevent dehydration. Take painkillers to relieve any pain. These include ibuprofen or paracetamol. Aspirin is not recommended for children under the age of 16. Apply petroleum jelly such as Vaseline or a water-based emollient. This will help to keep the skin cool and moist. Avoid additional exposure to the sun, including indirect exposure through windows. Cover all affected skin areas while your skin is healing. When it comes to severe sunburn, there are special burn dressings and creams that can be recommended or provided by your doctor or other medical professional. A medical professional may recommend that you use hydrocortisone cream to reduce skin inflammation. Hydrocortisone cream can purchased at local drug stores and pharmacies. In some serious cases, hospital treatment may be also be recommended. Sunburn is uncomfortable, irritating, and painful, and can cause extensive damage over time. People suffering from sunburn should take immediate measures to get sunburn relief, especially if the burning is severe. Preventing sunburn is important not only to avoid pain and discomfort, but also to decrease risk of serious damage and disease. Ultimately, it’s best to prevent sunburn altogether by staying out of the sun, covering up with protective clothing, and always using high-quality sunscreen.